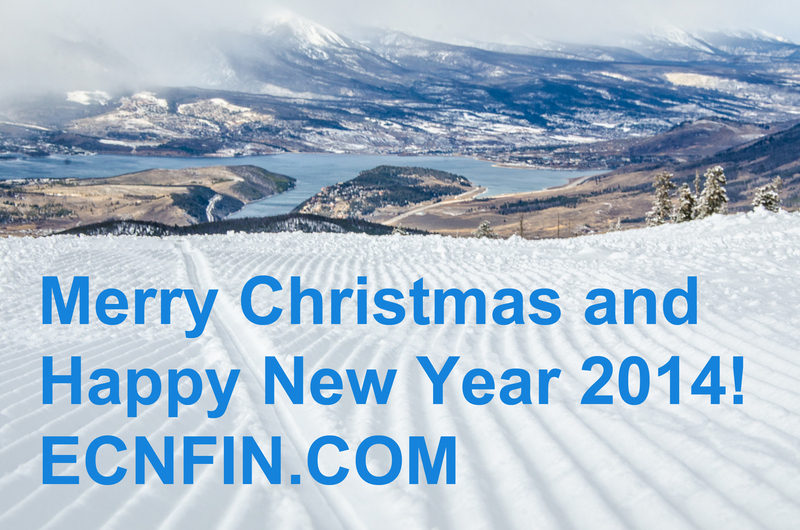 It is the Holiday Season and we would like to make a new tradition here at ECNFIN by reviewing the current year stock market performance and looking into the future. We wish you happy and safe holidays full of wonderful memories and great times! May the new year 2014 be the best new year yet! Happy Holidays! May 2014 bring you happiness and success! This photo was taken at the top of Keystone Resort in Colorado, in November 2013. Let it snow! Would you like to read about bullish or bearish forecast first? The first forecast draws a gloomy picture for the year 2014, based on the GDP growth alone, the S&P 500 Index is due for a 8.86% – 9.49% correction and is expected to close between 1,633.68 and 1,645.06 at the end of 2014. The second result is more optimistic, as we include other favorable reasons, the stock market is expected to appreciate between 8.48% and 9.11% for the year 2014, or the S&P500 Index is expected to close between 1958.16 and 1969.53. This forecast is based on the original article published by ECNFIN on March 15th, 2013. Back then, the expected GDP growth was used to forecast the S&P 500 Index in the future. The original model has forecasted the S&P 500 Index to be between 1,528 and 1549 for the year-end 2013. Based on the Gross Domestic Product (GDP) growth alone, the S&P 500 Index was expected to increase between 7% and 8.6% during the year 2013 (ECNFIN, March 25, 2013). Now, it is clear that the stock market did much better than 8.6% upside prediction made earlier this year. According to Yahoo Finance, the S&P 500 Index was up 26.57% from December 31st, 2012 through December 6th, 2013. Before making a new forecast for 2014, lets analyze the actual stock market performance and compare it to the original prediction made back in March 2013. On Friday, December 6th, 2013, the S&P 500 Index closed at 1805.09 which is 26.57% higher than its close price as of December 31, 2012. Comparing actual 26.57% increase with expected 8.6% based on the GDP growth alone, the stock market appreciated by an extra 17.97% due to other reasons besides the GDP. We can speculate as to what these other reasons can be: the Federal Reserve Bank’s buying spree of $85 billion bonds per month; low target federal funds rate between 0% and 0.25%; fear of the Fed tapering its bond purchases and investors preferring equities to fixed income; cost cutting measures by companies that help drive earning higher despite moderate growth of their top line sales; the US having relatively better economic growth and healthier corporate balance sheets in comparison to other foreign countries. All these could be valid reasons for the stock market to perform remarkably well in 2013 and produce an unexpected total return of 26.57% as of December 6, 2013. The example above shows that the GDP alone cannot explain all of the increase in the S&P 500 Index during the year 2013. Even though, the GDP growth failed to predict the performance of the S&P 500 Index for the year 2013, we should not discount its significance. The GDP is still a very important foundation on which the stock market performance is based. Historically, GDP explained 88.76% of performance in the S&P 500 Index according to the linear regression model published in the earlier article “Gross Domestic Product Behind the Stock Market Performance” (ECNFIN, March 25, 2013). The Year 2013 was full of exceptions: companies were able to increase earnings without relying on the GDP growth too much. This trend is only temporal, and the long-term stock market performance should depend more on the GDP growth going forward. Believing that the GDP growth is still a significant factor in explaining the stock market performance, this new article will forecast the S&P 500 Index at the end of 2014 by using updated linear regression model originally described in the article “Gross Domestic Product Behind the Stock Market Performance” (ECNFIN, March 25, 2013). 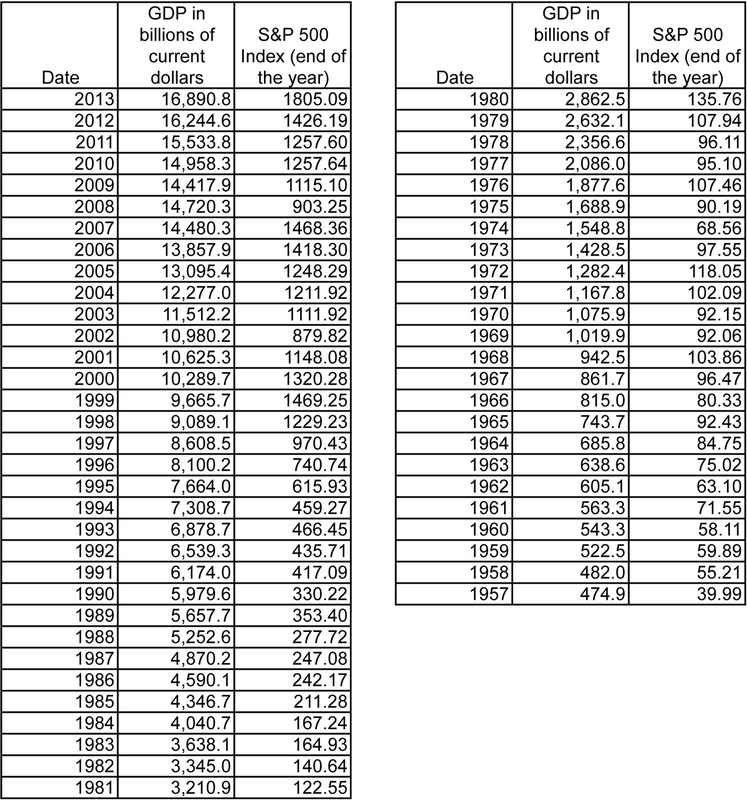 The new updated equation takes into account the most recent GDP and S&P500 data for 2013 (see Table 1). S&P 500 Index (end of the year) = -59.4568 + 0.0962 * GDP in Billion of Current Dollars (for the entire year). Explaining S&P500 Index performance using GDP growth alone. Before we can forecast the future S&P 500 Index, we need to calculate the expected GDP growth for 2014. Using economic projections of the Federal Reserve Board Members and Federal Reserve Bank Presidents as of September 18th 2013, we obtain the data to calculate the expected GDP during the year 2014. Based on the central tendency statistics, the expected change in real GDP is between 2.9% and 3.1% for the year 2014. Personal Consumption Expenditure (PCE) inflation is expected to be between 1.3% and 1.8% during 2014 (September 18, 2013). As the result, the nominal expected GDP growth can be calculated between 4.2% and 4.9% for 2014. According to the US Department of Commerce, the most recent annualized GDP data for the third quarter of 2013 is $16,890.8 in current dollars (December 5, 2013). Assuming that the GDP will increase between 4.2% and 4.9% during the year 2013, we calculate the GDP in current US Dollar to be between $17,600.21 billion and $17,718.45 billion for the year 2014. Please note that these numbers are expectations only and will likely to be different from the actual GDP growth in 2014. S&P 500 Index (end of the year) = -59.4568 + 0.0962 * 17,600.21 or 17,718.45 = 1,633.68 or 1,645.06. Based on expected GDP growth alone, the S&P500 Index is forecasted to decline between 8.86% and 9.49% in comparison to its current value of 1,805 as of December 6, 2013. The expected GDP growth does not support the currently high level of the S&P 500 Index. However, there can be other reasons for the S&P 500 Index to advance higher as we saw during the year 2013. From the earlier discussion in this article, the stock market had an extra 17.97% increase due to other reasons besides the GDP growth in 2013. If these other reasons remain (stimulative monetary policies, increase in corporate earnings, comparatively favorable investment environment in comparison to other asset classes or other foreign stock markets) the US stock market may experience a similar extra 17.97% return, which is not explained by the GDP. Taking into account other favorable reasons, the S&P500 Index is forecasted to appreciate between 17.97% – 9.49% = 8.48% and 17.97% – 8.86% = 9.11%. The S&P500 Index is forecasted to close between 1958.16 (1805.09*1.0848) and 1969.53 (1805.09*1.0911) at the end of 2014. The S&P 500 Index performance depends not only on the GDP but on other economic and business factors as well. This article produced two possible forecasts. First result is gloomy, based on the GDP growth alone, the S&P 500 Index is due for a 8.86% – 9.49% correction and is expected to close between 1,633.68 and 1,645.06 at the end of 2014. The second result is more optimistic, as we include other favorable reasons, the stock market is expected to appreciate between 8.48% and 9.11% for the year 2014, or the S&P500 Index is expected to close between 1958.16 and 1969.53. Forecast of the future S&P 500 Index is based on historical data and future expectations that may not be correct. This paper was written as an opinion only. The data is not guaranteed to be accurate or complete. Please consult with your financial advisor before making an investment decision. ECNFIN.com is not associated with nor does it necessarily represent the opinion or advice of Culver Investment Company LLC. Past performance doesn’t guarantee future results.